Bureau of Land Management decides to move forward with controversial renewable energy project, Soda Mountain Solar Project. Baker, CA – Today, the Interior Department’s Bureau of Land Management (BLM) announced its decision to move forward with a modified version of the Soda Mountain Solar Project, widely regarded as the most controversial renewable energy project in the Country. The Interior Department’s decision to issue a final environmental impact report recommending the project be approved less than a quarter mile from Mojave National Preserve comes after nearly 19 months of deliberation, during which thousands of recreational users, national park lovers, scientists, and the National Park Service urged denial of the project. In its press release, the BLM noted the active transmission and transportation corridor in the project site area. 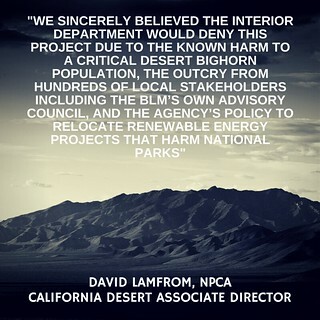 Missing from the statement is the project site’s location, less than one mile from Mojave National Preserve, which welcomed more than 550,000 visitors in 2014 who spent more than $31 million in communities near the park, supporting over 450 jobs. In April, 120 business leaders, Bureau of Land Management (BLM) stakeholders, scientists, and former Interior Department employees petitioned the Interior Department to designate Soda Mountains an Area of Critical Environmental Concern (ACEC). The BLM’s final environmental impact report will include a 30-day “protest” period before the agency can issue its record of decision on the project.